Welcome Home America Gifts Reports 118% Average Sales Growth for 2nd Quarter 2007. Total sales have increased an average 136%, with 118% shown in the Second Quarter 2007, since WHAGifts.com launched their new website in March 2007. The ecommerce site provides 2,500 promotional items that primarily serve the apartment property management industry. Welcome Home America Gifts, http://www.whagifts.com , provides quality marketing tools, flags, banners, grounds maintenance supplies, and resident move-in gifts for the Multifamily Housing Industry. Customer Service Manager Cathy Slone states, "Our new website developed by Spherexx.com is not just easy to use, it is organized so that our customers can quickly find our products. We are delighted with its success"
Spherexx.com has published a WHAGifts.com ecommerce case study that is viewable at http://www.Spherexx.com/showcase. Although Spherexx.com serves a range of industries, their primary focus is developing web-based prospecting, marketing, information management, and support services for the national multi-family housing and real estate industries. Their innovations include interactive floor plans (virtually arranging furniture in floor plans to scale), interactive site plans, 3D animation tours, targeted search engine strategies for lead generation, online rental applications & integrated online rent payments. Their lead tracking and follow-up tools are branded under http://www.GotNoVacancy.com , http://www.HomeClosingtools.com and http://www.MyClosingTools.com. 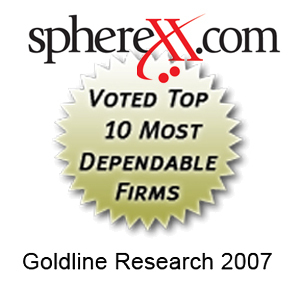 Spherexx.com was founded in 2000 and has offices in Tulsa, OK, Dallas, TX and Houston TX. Spherexx.com fuses marketing, branding, and technology to increase sales and market share for their clients. Spherexx.com maintains a national footprint and specializes in the real estate industry; however, they serve other industries like healthcare and financial services. Their service menu includes website design & development, touch-screen kiosks, marketing services (logo design, branding, video/multimedia production, 3D animation, copywriting) website & email hosting, remote backup storage, database solutions, lead tracking & sales closing tools, search engine positioning, pay per click, e-commerce solutions and custom programming.